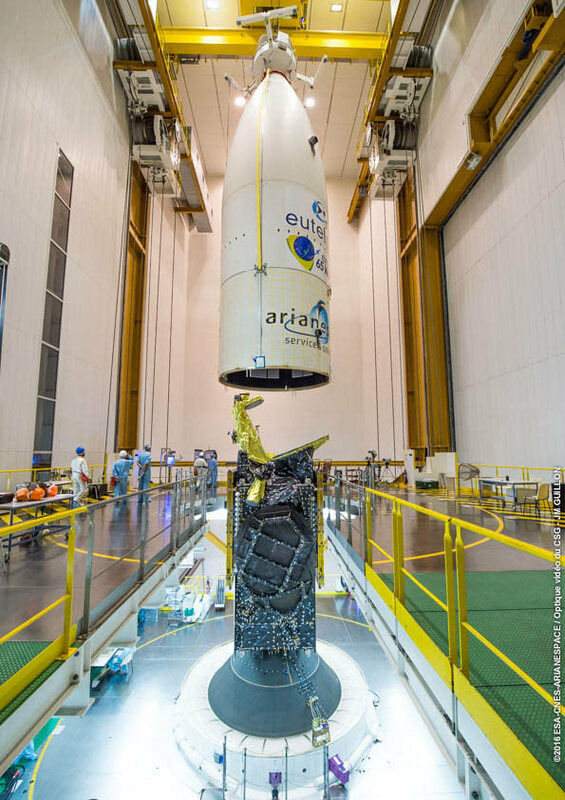 An Ariane 5 rocket rolled to its equatorial launch pad at the Guiana Space Center on Monday to set the stage for a Wednesday morning liftoff, carrying the Eutelsat 65 West A satellite to Geostationary Transfer Orbit. 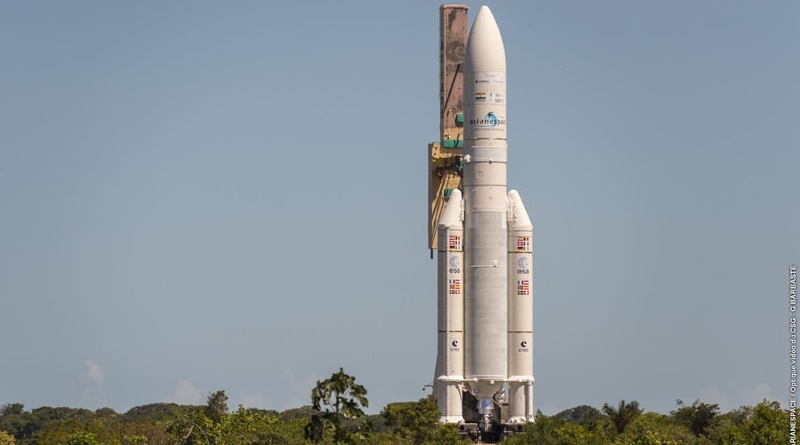 The mission has a three-hour launch window opening at 5:20 UTC, 2:20 a.m. local time and Ariane 5 will need half an hour to deliver the satellite to its planned orbit, to be followed by an hour-long engineering demonstration carried out by the upper stage of the workhorse launcher. This is the second single-payload launch using Ariane 5 this year, coming after January’s successful launch of Intelsat 29e. 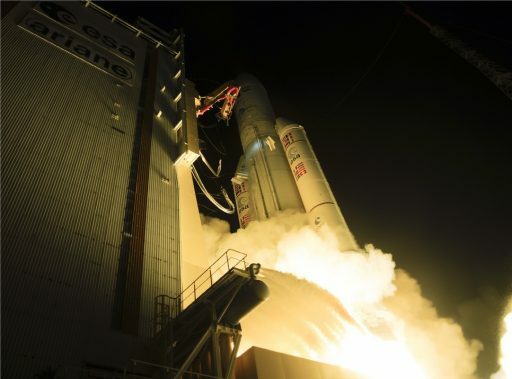 Both Eutelsat and Intelsat were faced with a long wait until a co-passenger in the 3,000-Kilogram range would have been ready and therefore, both companies decided to foot the bill for entire Ariane 5 rockets, instead of accepting the delay and splitting the price with another satellite operator. Eutelsat 65 West A is a high-capacity communications satellite, built by Space Systems/Loral based on the flight-proven LS-1300 platform. It is outfitted with a hybrid communications platform comprised of 10 high-power C-Band transponders delivering a broad coverage zone over the Americas, 24 Ku-Band transponders to generate a pair of coverage zones over South and Central America, and a high-throughput Ka-Band payload to deliver spotbeam coverage over densely populated areas. Taking up a spot at 65°W in Geostationary Orbit, Eutelsat 65 West A will deliver video and Direct-to-Home television with its C- and Ku-Band payload while the Ka-Band system delivers high-speed broadband. The satellite’s position has been selected to deliver excellent elevation angles for a growing pay-TV neighborhood in Brazil. The goal for Eutelsat 65 West A is to be on station and ready for operations by the start of the 2016 Olympics held in Rio. This schedule pressure was a main driver in the decision to place the spacecraft on a dedicated Ariane 5 rocket. Eutelsat made the decision to opt for a Solo Mission on Ariane 5 in October, to follow the Intelsat 29e mission and help decompress Ariane’s launch manifest as satellites to ride in the lower payload berth for dual missions had become hard to find to be matched with either Intelsat 29e or Eutelsat 65 West A. The components of the VA229 Ariane 5 launch vehicle were delivered to French Guiana in early January aboard the MN Colibri, one of two sea-going vessels transiting between Europe and French Guiana to ship launch vehicle parts from their manufacturers to the launch site. 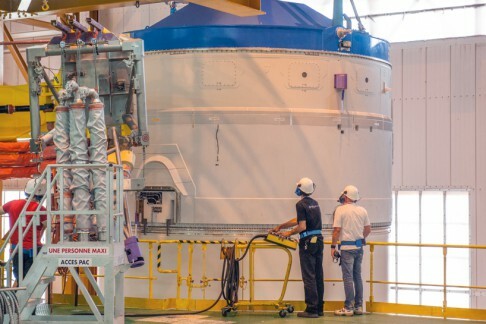 By mid-January, the assembly of the Ariane 5 rocket began at the Vehicle Integration Facility, starting with the 30.5-meter tall core stage that was installed atop its Mobile Launch Platform before the two assembled Solid Rocket Boosters were installed on the EPS core stage. The twin boosters were integrated at a dedicated facility before rolling out to meet the rest of the Ariane 5 rocket. The next step was the installation of the ESC Second Stage, already integrated with the Vehicle Equipment Bay, atop the Core Stage, clearing the way for integrated testing of the vehicle, beginning by the end of January. The Eutelsat 65 West A satellite was delivered to French Guiana on February 6 after a ride on an An-124 cargo airliner taking the spacecraft from California to its launch site. Immediately after arriving at the processing facility, the satellite was unpacked and started a series of inspections and stand-alone testing to verify it had not suffered any damage when being flown to South America. With a clean bill of health, Eutelsat 65 West A headed into propellant loading, receiving Unsymmetrical Dimethylhydrazine and Nitrogen Tetroxide needed for its climb into Geostationary Orbit. 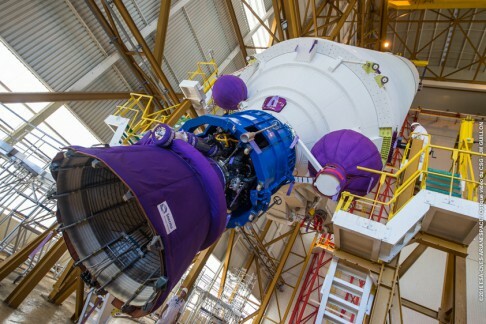 Propellant loading was completed by February 18 and the satellite was installed atop its Payload Adapter followed by final checkouts. In the meantime, the assembled Ariane 5 rocket was moved over to the Final Assembly Building, also marking the transfer of the rocket from prime contractor Airbus Safran Launchers to Arianespace that handles the payload integration and launch. 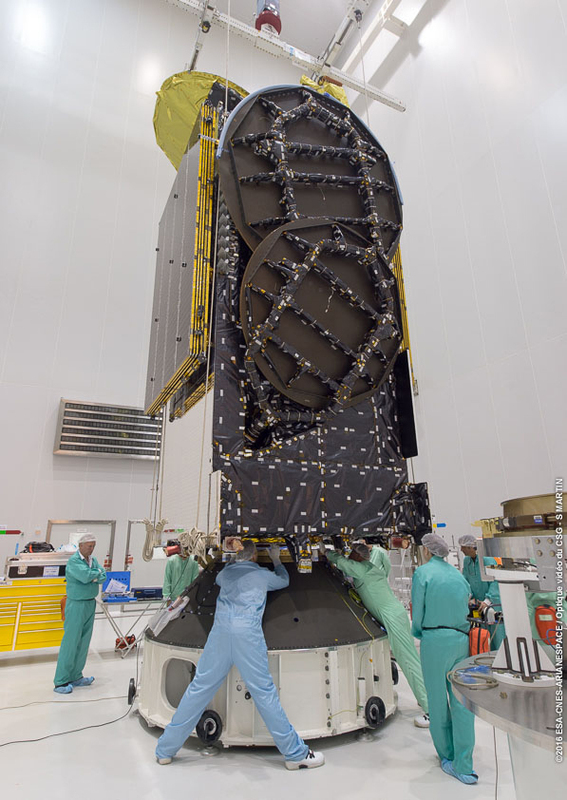 Eutelsat 65 West A was transferred to the Final Assembly Building and hoisted atop the Vehicle Equipment Bay where its payload adapter was installed and electrical connections were put in place. Next was was the encapsulation of the satellite in the 17-meter long payload fairing, marking the last time the 7.9-meter tall spacecraft would be seen on the ground. Late last week, Ariane 5 and the Launch Team went through Mission Simulation Tests before the launcher headed into ordnance installation over the weekend. Mission Managers convened on Friday for the Launch Readiness Review that confirmed Ariane 5, Eutelsat 65 West A and all ground support systems were ready to support the mission. With no outstanding issues, Ariane 5 was cleared for its rollout on Monday. Sitting atop its Mobile Launch Table, Ariane 5 slowly emerged from the Final Assembly Building for its trip over to the ELA-3 launch complex to enter final preparations for the initiation of countdown operations. The trip to the launch pad took about one hour and the launch table was precisely centered on the pad to enable teams to put in place propellant umbilicals, mate data and electrical connections and complete a last set of checkouts before closing out the complex for countdown operations. 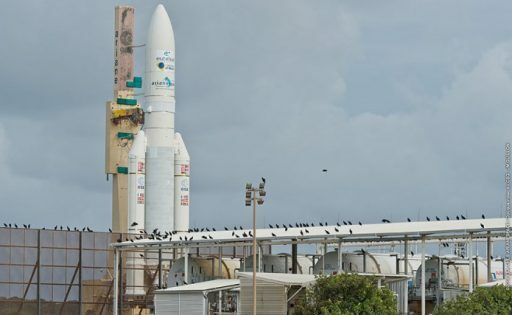 On Tuesday, teams will complete final hands-on work at the launch pad as the 11.5-hour countdown gets underway with tanking preparations and testing of the Ariane 5 rocket. A detailed Ariane 5 countdown timeline is available here. The 53-meter tall rocket is set for liftoff at 5:20 UTC on Wednesday under the power of the Vulcain 2 main engine of the Core Stage and the two Solid Rocket Boosters that will be doing most of the work as Ariane 5 aligns itself with its due easterly flight path for a fast trip across the Atlantic Ocean. The twin boosters will burn for two minutes and 23 seconds before separating from the Ariane 5 launch vehicle. Powered by the Vulcain 2 engine alone, the vehicle will depart the dense atmosphere for the separation of the Payload Fairing three minutes and 39 seconds into the flight. The first stage will shut down eight minutes and 49 seconds into the mission with the separation of the stage nine seconds later and followed by the ignition of the HM-7B engine of the second stage on a burn of 15 minutes and 42 seconds. Lifting a lone satellite allows Ariane 5 to use surplus performance for a reduction in inclination, cutting the time and fuel needed by the satellite when making its transition to Geostationary Orbit. The mission is targeting an orbit of 250 by 35,746 Kilometers at an inclination of 0.5 degrees. Eutelsat 65 West A is set for separation at T+27 minutes and 23 seconds, starting its 15-year mission of delivering communication services to the Americas. 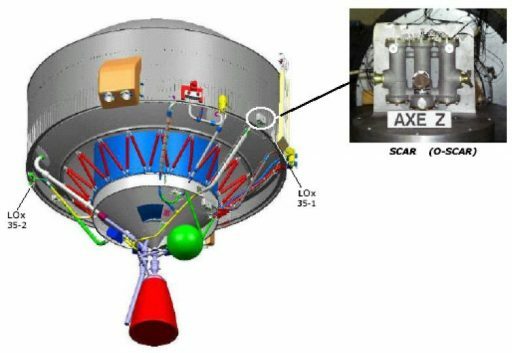 DEMOFLIGHT begins with the self-pressurization of the ESC-A propellant tanks followed by a propellant settling maneuver by igniting the reaction control thrusters to deliver a small acceleration that causes the propellants to form a two-phase system to ensure the engine only receives liquid propellants without gas bubbles when being re-started. Propellant settling will continue for the third operation that occurs at T+59 minutes when the tanks will be pressurized with Helium. For that, the VA229 mission is carrying an additional Helium bottle on its second stage. The HM-7B will complete an experimental chilldown one hour after launch to demonstrate the behavior of the second stage when chilling down an engine for re-start. Next, the HM-7B will complete a perigee-decrease boost by opening the LOX valves to allow pressurized oxygen to escape through the engine nozzle and supply a small thrust component. The same will be done on the LH2 side a short time later and LOX/LH2 will complete a combined perigee-decrease boost. The final DEMOFLIGHT objective is flushing of the LOX dome.